Mankind had to come a long way, according to archaeological studies and biblical stories, before being able to properly harvest the wheat of the field and store the seeds in granaries. Early in the book of Genesis, when Adam and Eve disobeyed God’s command to not eat from the Tree of Knowledge, Adam’s punishment was that “the ground will be cursed for you…thorns also and thistles it will bring you; and you will eat the herb of the field” (Genesis 3:17-18). Archaeological research has indeed confirmed that, man did in fact subsist on wild plants gathered from the fields until approximately 10,000 years ago, at which point man developed the ability to cultivate grain and wild wheat. This occurred during the Neolithic Era, the New Stone Age – from the Greek neo (new) and lithos (stone). During this period man also began using stone to make common tools. The Talmud teaches that when God said to Adam that “thorns also and thistles [the ground] will bring you”, Adam broke down in tears and said “Master of the Universe! Will I eat from the same trough as my donkey?” In an early form of social protest, man, considered to be the “crown of creation” is demanding the justice of being treated differently, better than the animals. God assuaged Adam’s fears and reassured him that “by the sweat of your brow you will eat bread” (Genesis 3:19), Adam was appeased. With the advent of bread, human history was irrevocably changed. Man now learned about the life cycle of plants, how to take only the best plants and store their seeds. This change enabled man to partake of a “different” kind of food – bread! Of course getting from wheat to bread is no easy task; a great deal of hard work is necessary. God said to Adam, “by the sweat of your brow you will eat bread” (Genesis 3:19). The sweat of the brow exemplifies the “battle for survival” that one must wage in order to attain bread, and the tremendous amount of effort necessary for man to eat. Unlike animals, who know how to find food in a quick and natural manner, it took man a very long time to before he had clothing, home and food. As the Sages taught “Look at all the work Adam had to do before he had bread to eat! He ploughed, he sowed, he reaped, he bound [the sheaves], he threshed and winnowed and selected the ears, he ground [them], and sifted [the flour], he kneaded and baked, and then at last he ate; whereas I get up, and find all these things done for me. Look at all the work Adam had to do before he had clothes to wear! He had to shear, wash [the wool], comb it, spin it and weave it, and then at last he had a garment to wear; whereas I get up and find all these things done for me.” (Babylonian Talmud, Berachot 58a). Wild wheat (Triticum dicoccoides) blooms in the Hebrew months of Nissan and Iyar (April) reaching a height of 70-100 cm (2-3 feet). Like most plants of the Poaceae family, the wheat plant is a stalk, made up of elongated spikelets along an axis. Each spikelet contains two seeds wrapped in chaff and glume, and tapers off to a sharp, arrow-shaped head point on one end with two hard, long awns, approximately 15 cm (6 inches) long on the other end. 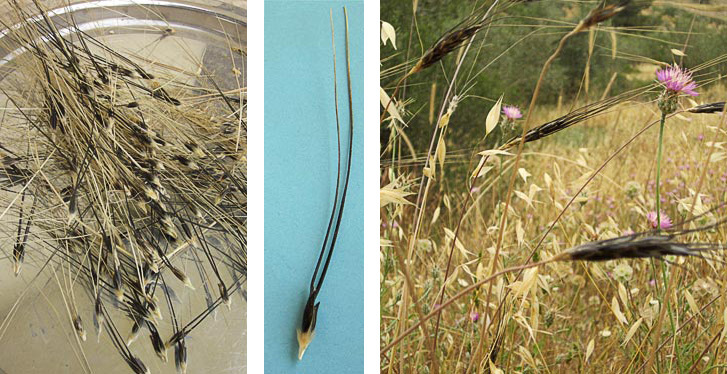 These awns are bristle-like appendages found in many grass plants (such as wheat). Wheat is self-pollinating, which means there is little exchange of genetic material through intermediaries such as wind or animals(1). In the Hebrew month of Sivan (June), the wheat ripens, accompanied by a variance, or polymorphism of colors; yellow, orange and black. At the same time, the stalk with the spikelets comes apart, and each spikelet falls to the ground, with the arrow-shaped head in the ground and the awns pointing upwards, thus protecting the seeds from birds or other animals and allowing the next generation of wheat to grow. The wheat is able to grow with a minimal amount of rain, and grows in rocky, chalky and basaltic soil, primarily in the Galil and Golan Heights. Wild wheat is the prototype, or the “early ancestor” of the wheat that is commonly known and used today. A study conducted by Zion Fahima from the University of Haifa and Jorge Dubcovsky from the University of California and published in 2009, revealed a gene found in wild wheat that provides the plant with a great resistance to wheat rust (puccinia), a common disease caused by a fungus that afflicts wheat crops worldwide. 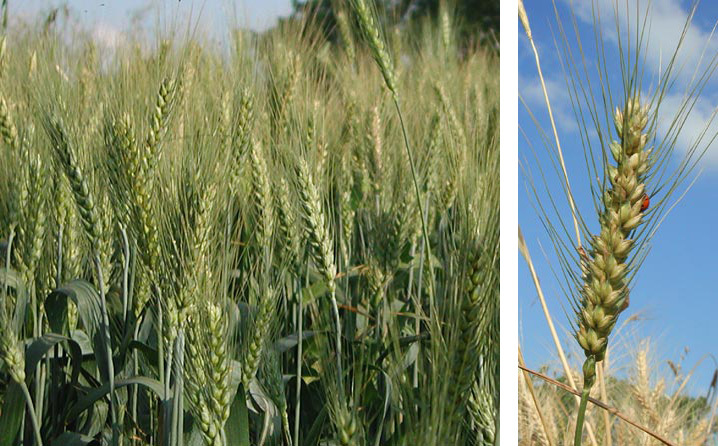 The researchers were able to plant the gene in various endangered strains of wheat, providing them with a resistance to the fungus. The Hareuvenis contributed greatly to the developing agriculture in Israel. Among other things, Hareuveni served as botanical consultant for the British Mandate government (1918-1923), and was worked hard to control the pests and diseases of plants, as well as finding species of plants suitable for growing in Israel. Hareuveni opposed importing wheat seeds from Europe, insisting that they were unsuitable for the growth here. He believed that it was important to rely only on locally grown strains of wheat, and he compared the issue to the biblical story of Abraham, who sent his servant to his homeland of Ur to find a wife for his son, Isaac, rather than finding one from among the Canaanites, Abraham felt that it was better to search from among his own people and place of origin, with whose merits and shortcomings he was familiar. The transition that mankind has made from gathering the seeds of wild wheat to cultivating wheat has brought about a tremendous change for humanity. Now, thanks to the cultivation of plants, people do not need to wander in search of food. (3) The seeds have been planted, so there is no need to go elsewhere. People can now establish permanent homes, permanent fields, develop the tools and instruments needed to work those fields, and even to live within our ever-growing society with more comfortable living conditions and plenty of food. This revolutionary change has been very significant for mankind. Biblical Adam, in eating from the Tree of Knowledge, radically altered his own life and ours as well. Among the attempts in the Talmud to identify the “Tree of Knowledge”, Rabbi Yehuda suggested that it was in fact wheat, which, as earlier discussed, has led to a higher level of knowledge, innovation and communication. Rabbi Yehuda compares the discovery of wheat to the development of speech in a baby, enabling him to communicate and learn more, which occurs at about the same age when a baby is first able to eat bread. “Rabbi Yehuda said ‘it [the Tree of Knowledge] was the wheat plant for an infant cannot say ‘father’ and ‘mother’ until he has tasted wheat’” (Babylonian Talmud, Sanhedrin 70b). The wheat used today for bread (Triticum Aestivum), originates from wild wheat, and is one of the most important crops in the world today, along with corn and rice. It originally developed in the Fertile Crescent, (the land from ancient Mesopotamia (Iraq of today) to Egypt, including Israel. Wheat is the first crop listed in the seven species of Israel, the “Land of wheat and barley and vines and figs and pomegranates, a land of olive oil and honey” (Exodus 8:8) and the many different names that the Torah uses to describe wheat in its various stages of growth and development indicate how important wheat is seen to be for mankind. The golden fields that we see in the month of Sivan provide us with a sense of calm and contentedness. They tell the story of mankind from the Garden of Eden to this very day, and allow us to pray for the truth of the words spoken by the prophet Elijah, “For the Lord, the God of Israel has said that the jar of wheat shall never run out: (I Kings 17:14). (3) Along with the cultivation of wheat, other foods are now also being cultivated, for example, legumes.